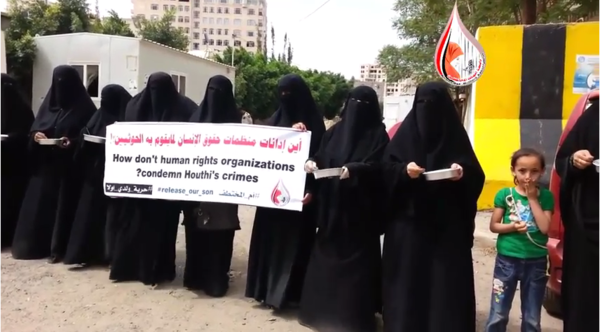 Women in Yemen protest outside the office of the country's High Commissioner for Human rights. Yemeni children demonstrate on the occasion of the UN's Universal Children's Day on November 20, 2017 in front of the UN offices in the capital Sanaa. The mothers of Yemen's disappeared fill city streets with the sound of their chants. They protest outside the prisons that hold their sons, and the offices of human rights workers they feel should do more to help. In Yemen's conservative society, women are rarely prominent in public life. But the women of the Abductees' Mothers' Association make themselves hard to ignore. They parade carrying fake corpses on stretchers. They bring with them the children of the jailed. In one recent protest, they banged spoons on plates, incessantly, outside the office of the country's High Commissioner for Human rights. "We call on human rights organizations to stand by our cause and break the silence that's shrouding this issue," one of the organizers of the group said. She asked not to be named for the sake of her brother, who is in jail, and who, she fears, might suffer retribution for her decision to speak with foreign media. "We try to lessen the suffering of the detained and their families," she said. "Most of what we do is stand and protest. There is risk with that we can get beaten and threatened, but it's a humanitarian cause." The group was formed a little over two years ago, in response to a surge in the number of people arrested and disappeared in Yemen's civil war. Activists and journalists who criticize militias are routinely imprisoned on both sides of the front lines. But this is especially true the capital Sanaa since it was taken over by Houthi rebels and allied militias in late 2014. Human Rights Watch has tracked dozens of arrests. But the organization also cites the work of local rights group who say thousands are arbitrarily detained. Journalists in particular are targets. In Sanaa, some reporters have now been in jail for years, in many cases still without a trial. Their mothers know that protests aren't enough to get them released. So, some of these women crossed the front lines and many checkpoints to meet me and a small number of other reporters in Marib, a city on the government side. A young mother, her face and body covered by the traditional conservative black garment, tells me her son was still a freshman in college when he was taken. He was studying journalism, but, she said, he was detained for criticizing Sanaa's new rulers on social media. "The charge against him is that he published his thoughts and opinions on Facebook," she said, asking that neither she nor son be named for their safety. She said her son was double-crossed by friends on the way back from a wedding. They had become supporters of the Houthi militias. "It was a setup," she said. "They stopped at a checkpoint in Sanaa and were surrounded by cars. He was taken away." Her son was 17 years old when he was imprisoned. She said he was sentenced in a court. But the hearing was private, and he was given no access to a lawyer. Since the sentence, she has been banned from visiting the prison where he is being held. But she learned about his condition from a fellow prisoner who recently got out. "He eats the rotten food or whatever leftovers the guards give him. Now he's in solitary confinement in the dark," she said. "They ask him to confess to things ... things that he didn't commit. Then they tortured him. They tied his hands and feet together for a week." Amin al-Ayashi is the mother of Tawfik Mansuri, a journalist who was taken in one of the most high-profile cases. Militias snatched him and eight other reporters from a Sanaa hotel – the Dreams Hotel – in 2015. They had been using the hotel as their office after it had become too dangerous to go to their newsrooms. It took Ayashi more than four months to find her son. She eventually tracked him down to a detention center for people being held without trial. She broke down in tears as she described seeing her son in prison for the first time. "Tawfik was in agony and he was tired," she said. "He is weak from torture." She visited Tawfiq with his wife and 9-year-old daughter. She said he put on a brave face for them: "He says he's fine. He never tells us he's not, but I see he suffers from the look his eyes. His skin is yellow – he's not allowed any sun." Many of the mothers we met had stories of torture. Their sons are beaten and deprived of sleep. Sometimes the guards play cruel games – one mother tells me her son was made to stand barefoot on an open can of tuna, for hours. Journalists are seen as especially dangerous criminals. Ayashi's family said they once got access to Tawfiq by lying to the prison guards about who they were coming to see. The mothers hope that their protests will garner enough attention to force their sons' release. But they say it's dangerous work. "We were detained several times, but we still continue," the organizer of the Abductees' Mothers' Association said. She described a protest in al-Hodeidah, a town outside Sanaa that's under Houthi control: "I and another female colleague were filming the protest and the Houthis took us for an investigation. We were touched and questioned and humiliated in a very disrespectful and humiliating way." They were eventually released. But she said, sometimes the militias go after male relatives in the family. And sometimes they even punish the bus drivers who take the women to the protests. "You rent a bus or a car to get you to where the protest is happening and then the bus or car driver would be chased and kidnapped," she said. A small number of members of the Abductees' Mothers' Association have seen their sons released, she said. But so far, none of the journalists have been freed. The mothers won't stop, she says, until they are. Now to the humanitarian situation in Yemen, which has been experiencing a civil war since 2015. The country has been largely closed off by Saudi Arabia. But just yesterday, aid workers and much needed supplies were allowed into Yemen for the first time in weeks. There are also regular detentions of journalists and activists. Getting word out about them is difficult, but a group of mothers of the missing is trying. NPR's Ruth Sherlock recently met with a few of them. RUTH SHERLOCK, BYLINE: A protest by mothers of the disappeared in Yemen. This video shows them banging spoons and plates on the street. SHERLOCK: Activists and journalists who criticize militias are routinely imprisoned on both sides of the war. But it's especially true in the capital, Sanaa. That's under the control of Houthi rebels and allied militias. Human Rights Watch has tracked dozens who've been arrested, and the mothers say there are many more. Since the protests aren't enough to get them released, some of these mothers crossed the front lines and many checkpoints to meet me and a small number of other reporters in Marib, a city on the government's side. SHERLOCK: This woman's son was arrested at a checkpoint. He was a freshman in college, studying journalism. She says all he did was speak out on social media. UNIDENTIFIED WOMAN #1: (Through interpreter) The charge against him is that he published his thoughts and opinions on Facebook. SHERLOCK: She says he's treated terribly in the prison. UNIDENTIFIED WOMAN #1: (Through interpreter) He eats the rotten food or whatever leftovers the guards give him. Now, he's in solitary confinement in the dark. SHERLOCK: She asks not to be named because just coming to meet us was a risky decision. The mothers say that speaking with the international media could make them targets when they go back, but they hope it will help. In one of the most prominent cases in 2015, the militias arrested nine journalists from a hotel in Sanaa. The journalists had been using the hotel as their office after it'd become too dangerous to go to their newsrooms. AMIN AL-AYASHI: (Foreign language spoken). SHERLOCK: Amin al-Ayashi's son, Tawfik, was one of the journalists that was taken. She says it took her four months to find her son. When she eventually tracked him down, he was in a jail for people being held without trial. AYASHI: (Through interpreter) Tawfik was in agony, and he was tired. SHERLOCK: She breaks down into tears. SHERLOCK: She says Tawfik is weak from torture. SHERLOCK: Lots of the mothers I spoke to who had stories of torture. Their sons are beaten and deprived of sleep. Sometimes the gods play cruel games. One tells me her son was made to stand barefoot on an open can of tuna for hours. Journalists are seen as being especially dangerous criminals. Ayashi's family says they once got access to her son by lying to the prison guards about who they were coming to see. The mothers I met are all part of the Abductees' Mothers Association. That's a group formed to help the families through all this. One of the women who asked not to be named explained their mission. UNIDENTIFIED WOMAN #2: (Foreign language spoken). SHERLOCK: In the protests, they carry fake corpses on stretchers. They bring the children of the prisoners with them. It can be dangerous. Sometimes, even the bus drivers get arrested for just taking them to the demonstrations. But the women say they will keep on protesting. Ruth Sherlock, NPR News, Marib. Transcript provided by NPR, Copyright NPR.